Bryndís Pétursdóttir er garðyrkjufræðingur og fjögurra barna móðir sem býr á Laugum í Reykjadal. Hún var skyggn sem barn og fékk fyrir nokkrum árum köllun um að hjálpa fólki sem líður ekki vel. Hún er mjög næm fyrir óþægindum sem hún finnur fyrir víða og byrjaði að rannsaka orsakirnar. Hún kynntist jarðfræðilegri streitu eða jarðárum og fann leið til mótvægis. Hún hannaði tæki, MÓTVÆGISKUBBINN, sem sveigir þessar bylgjur og gerir þær óskaðlegar. 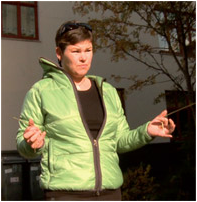 ​​Bryndís Pétursdóttir lives in Laugar, a small town in north of Iceland, she is married to Jón Friðrik Benósnysson and a mother of 4 children. They run a guesthouse, North Aurora Guesthouse. She works as a healer for people and animals. She is a electromagnetic field explorer, and has worked many projects for farmers, schools and big office buildings to secure a better energy and to balance the working environment in the houses - with very good results. She became aware of geopathic stress that was damaging peoples and animals health and found a way to counteracting that condition. 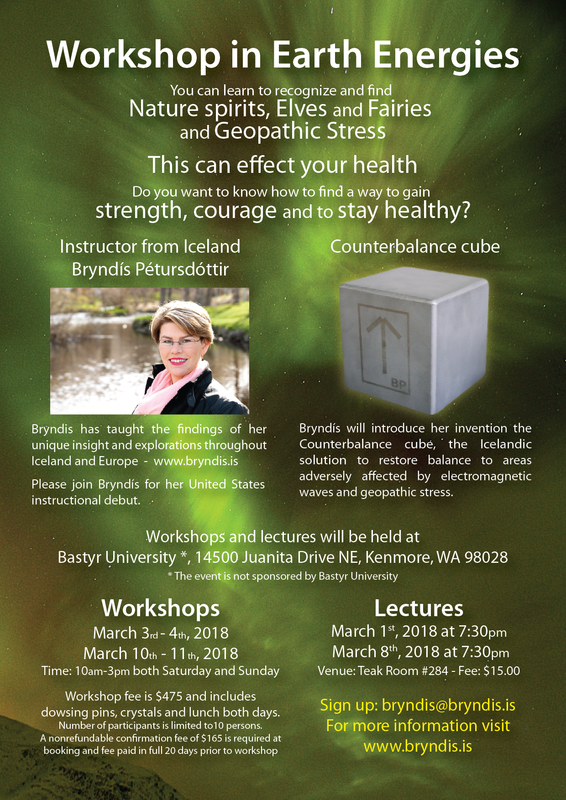 She designed a device, Counterbalance cube, which transformes difficult energy ( geopathic stress) into a ligth and normal energy . - European College of Bowen studies. - The Arthur Findlay College, Lionel Owen.